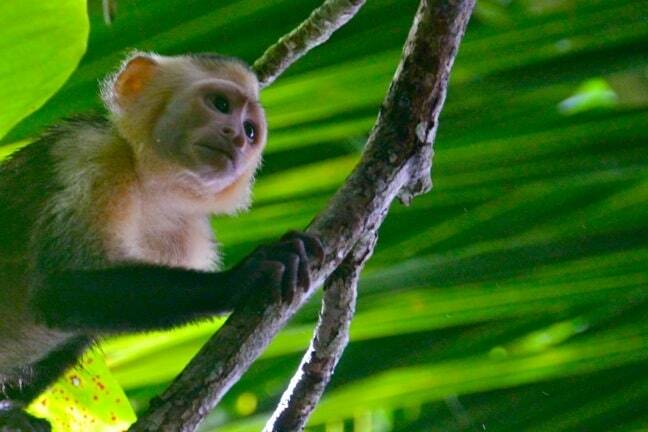 At 164 square miles, it’s the largest national park in Costa Rica, the largest primary forest on the American Pacific coastline, and one of the few remaining large areas of lowland tropical rainforests in the world. It’s also one of the most pristine nature sanctuaries we’ve ever visited. 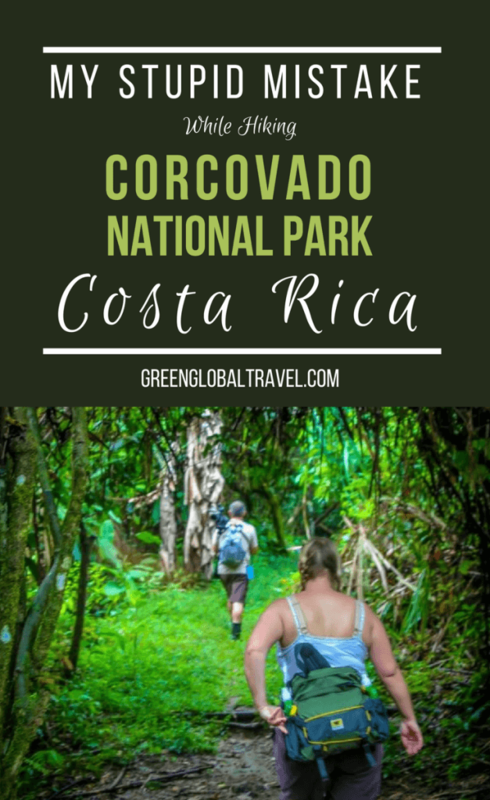 Corcovado offers an impressively diverse array of ecosystems, ranging from montane forest and cloud forest to prairie and mangrove swamp. 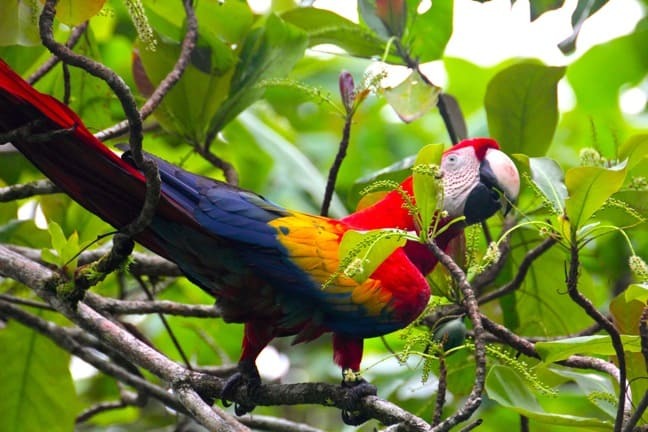 The park provides a home for more than 500 tree species and a dizzying array of Costa Rican animals, including the endangered Baird’s Tapir, the rare Harpy Eagle, Jaguar, Puma, and four Monkey species. In short, it’s a veritable Garden of Eden for nature-lovers like us. There’s a change that washes over me every time we venture away from the city and into the remote wilderness of a place like Corcovado. It’s a feeling I’ve gotten every single time we’ve explored the wealth of ecotourism activities and attractions in Costa Rica. It’s a mental, emotional, spiritual and physiological transformation. It feels as if the Universe is taking the myriad pieces of the puzzle of my soul– which often feels discombobulated and disconnected by the daily complexities of “civilization”– and reassembling them into a perfectly congruous whole. My senses come alive. My eyes, heart, and mind are wide open. My spirit is filled with an almost childlike awe and wonder. It is in moments like these that I feel most like the man I was always meant to be. I connect with the NATURAL me, perfectly in tune with myself and the world around me. Perhaps this explains why places like Corcovado make me feel so at home, and at peace. 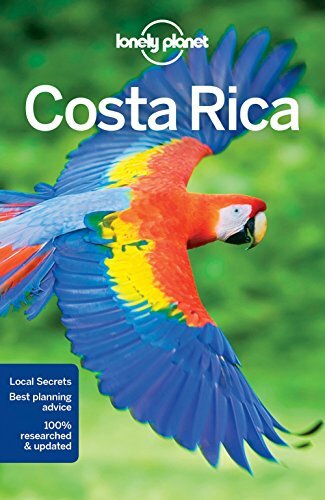 The easiest way to get to Corcovado is to fly out of the airport in San Jose. Numerous carriers offer flights for around $80-$100 each way. 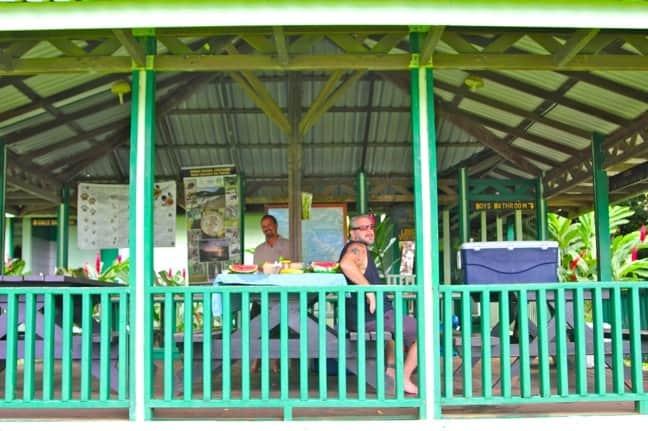 If money is no object, you can even charter a private flight that will take you directly to the Sirena Ranger Station, in the heart of the park. It’s also possible to drive to the park, but a sturdy 4WD vehicle is highly recommended. There are two main routes: The Pan American Highway heads east from San José, climbs over the Cerro de la Muerte mountains, then eventually gets you to Puerto Jimenez around 4 hours later. The Caldera Rd (Hwy 27) is more scenic, taking you along the Coastal Route (Hwy 34) to Palmar, where it meets the Pan American Highway. 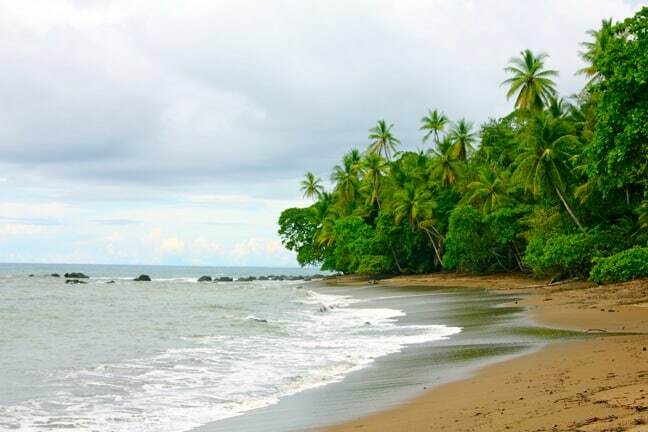 Both routes require travelers to take an inexpensive ferry from Puerto Jimenez to reach the park. As our Nature Air flight heads southeast of San Jose towards the tiny town of Palmar Sur (in the Osa region of Puntarenas), I can already feel the stress being shrugged from my shoulders. It’s as if I were shedding filthy work clothes and taking a hot shower at the end of a long day. We pass over remote mountain villages, winding rivers and, finally, the Pacific Ocean. All thoughts of deadlines and other responsibilities begin to fade from my mind. My breathing slows, my body relaxes, and I start to notice all the beautiful details. I see cotton-fluff clouds caressing a verdant hillside, the vibrant hues of water where the river meets the sea, the impeccable symmetry of an oceanside palm plantation. 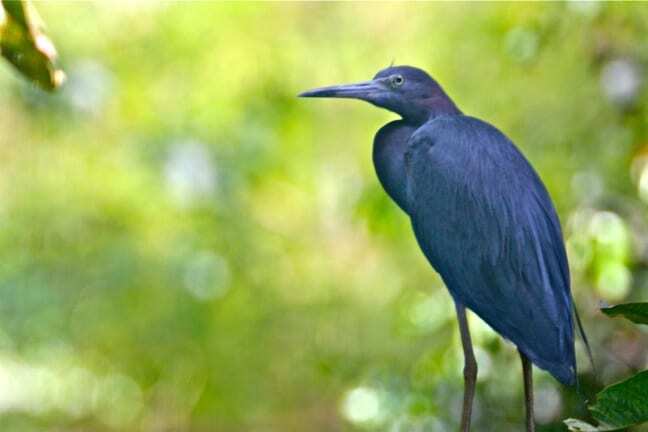 If you’re not in a rush, the most exciting way to get to Corcovado National Park is to fly into the Palmar Sur airport and head to the town of Sierpe. As we put our gear into waterproof bags for the 2-hour boat journey to the lodge, that familiar Costa Rica climate kicked in. The heat, humidity, and dazzling play of sunlight on the water of the Sierpe River combined to create a pleasant, fuzzy-brained feeling I can only compare to a fever dream. 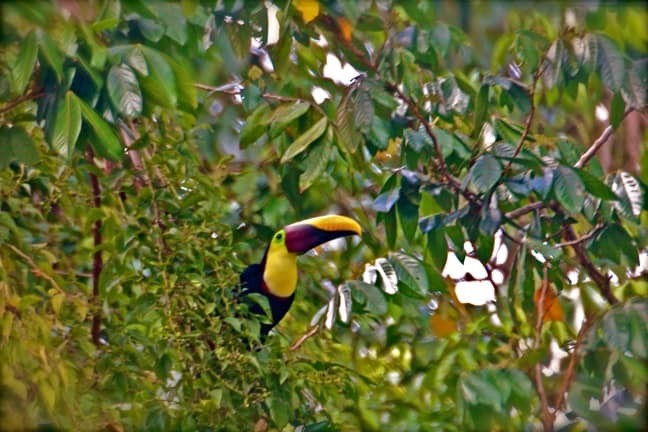 We’re less than two minutes into our journey to Corcovado when “Eagle Eye” spots our first Costa Rican wildlife. 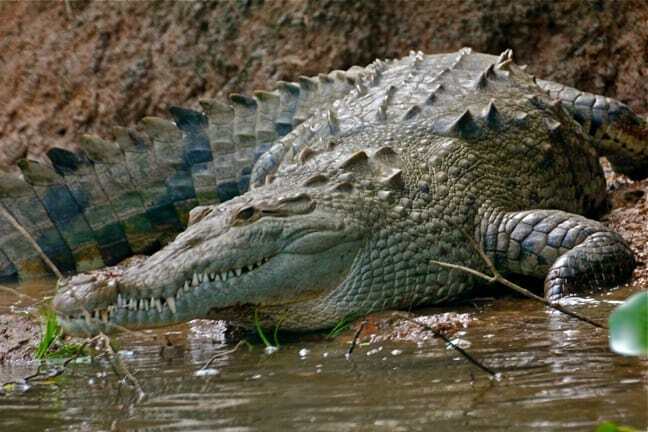 It’s a gargantuan American Crocodile (which average 12-16 feet in length) sunning himself on the muddy river bank just a few hundred yards from the dock. After posing perfectly while we snap our camera shutters frantically in an effort to capture his fearsome presence, he slips into the river’s murky waters, eyeing us suspiciously. 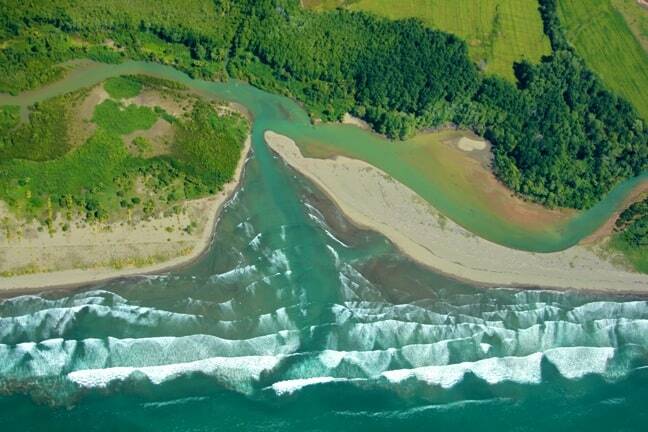 Long before the town of Sierpe existed, the Sierpe River was considered sacred by Costa Rica’s indigenous natives. They named it after the Spanish word for “snake” because of the way it winds its coils through the Térraba River. 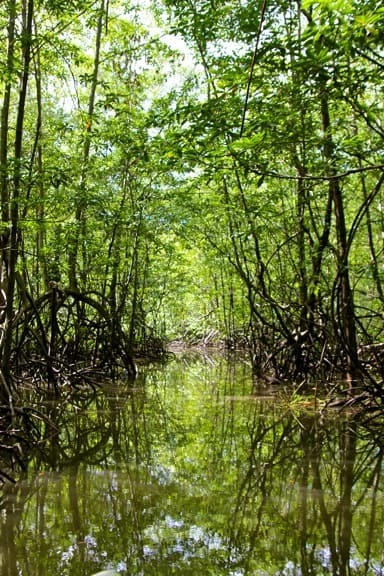 The river is part of a massive mangrove estuary that is now conserved as the 66,850-acre Térraba-Sierpe National Wetlands. Local legend holds that shaman apprentices, during their last week of training, were required to go on a vision quest. The apprentices would climb seven mountain cascades in order to collect fungus they would use to make a hallucinogenic tea. Then they’d spend seven days drinking and fasting, spending one night at each of the river’s seven different mouths (the heads of the snake). Spending time in each of these different locations was believed to impart different fields of knowledge, from astronomy and other sciences to spirituality and medicine. Only after going through this ancient rite of passage could the men of the Sierpe region hope to become a shaman. The narrow channels prove to be teeming with wildlife. “Eagle Eye” earns his nickname by spotting a veritable cornucopia of endemic Costa Rican species. Many of them are tucked so far back into the woods that it takes several moments to spot them, even through my 500 mm lens. Not all of the area’s animals prove quite so reclusive. 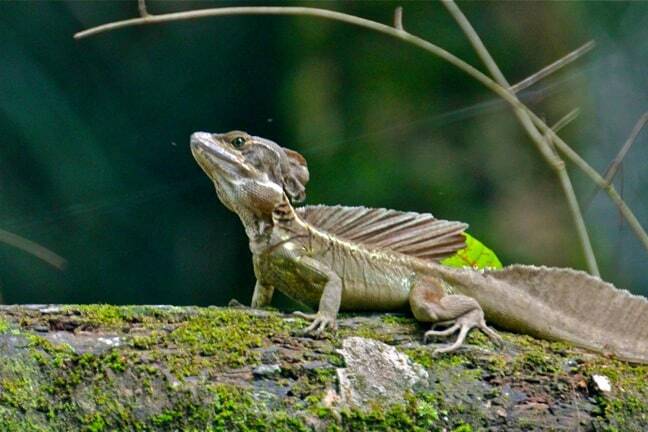 A Basilisk (commonly known as the Jesus Christ Lizard for its ability to run on water) suns himself on a log at eye level, right by the river. Eventually we disembark with a wet landing on the rocky beach at Casa Corcovado Jungle Lodge, a Rainforest Alliance-verified eco lodge located right on the fringe of Corcovado National Park. By this time, my transformation from bleary-eyed workaholic to wonder-filled nature-lover is finally complete. The Capuchins romping on the shore elude my lens, and the skies suddenly open up with the sort of intense tropical deluge you rarely experience outside the rainforest. But still my spirit feels lighter, more carefree than it has in months. And as we sit in the lodge’s bar– savoring a welcome drink, watching hummingbirds flit about, and listening to Howler Monkeys calling in the distance– I know that, finally, I am home. I’ve done some truly dumb things before on my travels. But I partly blame what happened in Corcovado on advice I got when I interviewed National Geographic photographer Peter Essick. I’d just gotten a Manfrotto Carbon Fiber Tripod, and had been disappointed with the quality of our past jungle photos in the past. 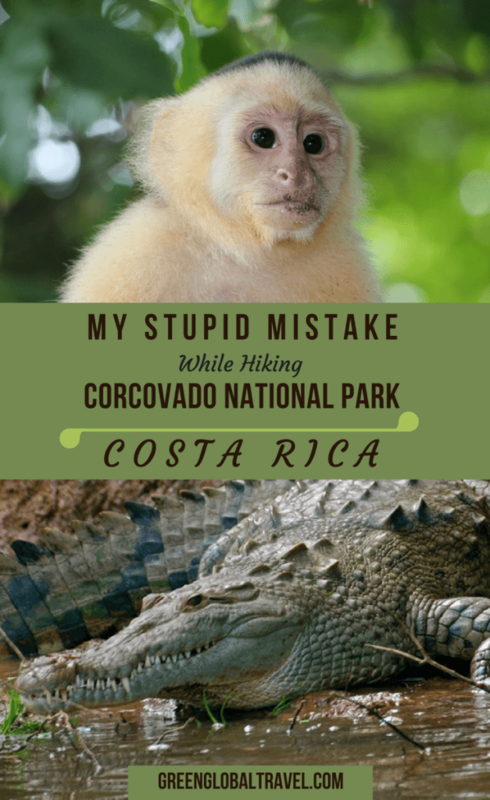 So I was anxious to follow Essick’s advice when we hiked to Corcovado National Park’s San Pedrillo Ranger Station. But I soon came to regret it. The problems began right from the get-go. We’d planned to start our first day of hiking at 7AM to avoid the hottest part of the day. (Keep in mind that “hot” in the rainforest is a hundred-and-Hades degrees, with 6000% humidity). But we woke up an intense tropical deluge that made you think about building an Ark, and waited until after 9AM for a break in the downpour. I ultimately decided it was time to buck up and carpe the diem. And that was my first mistake. 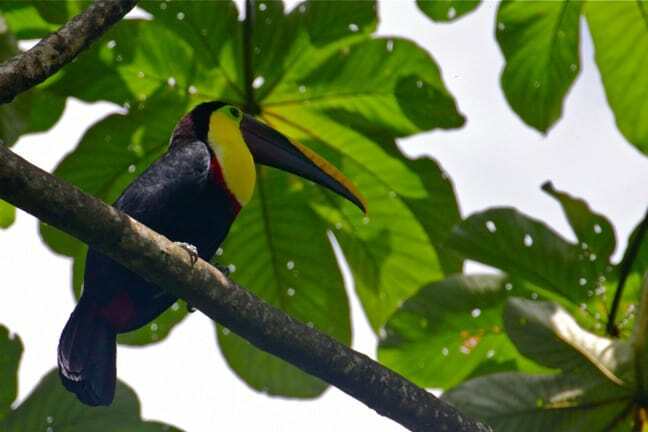 The hike was slow-going from the very beginning: We stopped before we even set foot off the lodge’s property to take photos of a Chestnut-Mandibled Toucan perfectly posed in the treetops. This involved setting up the tripod, attaching the long-range lens to the camera, getting the angle and composition just right, and then packing everything up again. I was drenched in sweat before we even got to the park. 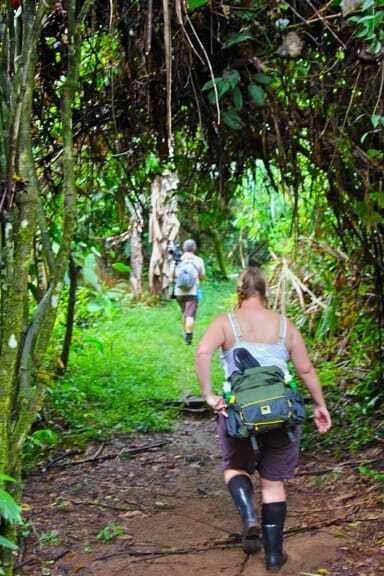 We traipsed through muddy jungle that squelched every time we took a step, eventually making our way onto a picturesque beach strewn with rocks. I stopped frequently to photograph things– a Mangrove Hawk here, a scenic beach vista there. Then I’d have to double-time it to catch up with Mary and our guide, Freddy Cruz. To speed the process up a bit, I left the camera and MASSIVE 500mm lens attached to the tripod, using it as a walking stick. This was my second mistake. At this point, a brief bit of personal history is in order: In 2012, when we visited the Peruvian Amazon, I made the mistake of not drinking enough water. I ultimately suffered a mild heat stroke that left me feverish and delirious, with bodily fluids coming out both ends. Being a learn-from-my-experiences type of guy, I’ve taken copious water and hydration tablets with me on every single hike we’ve done since then. Unfortunately, between the 8 bottles of water, hydration tablets, extra camera lenses, and snacks in my backpack and the camera gear in my hand, I was carrying around 40 pounds of extra weight. Weighing in at over 240 pounds, I’m not exactly a tiny man to begin with. 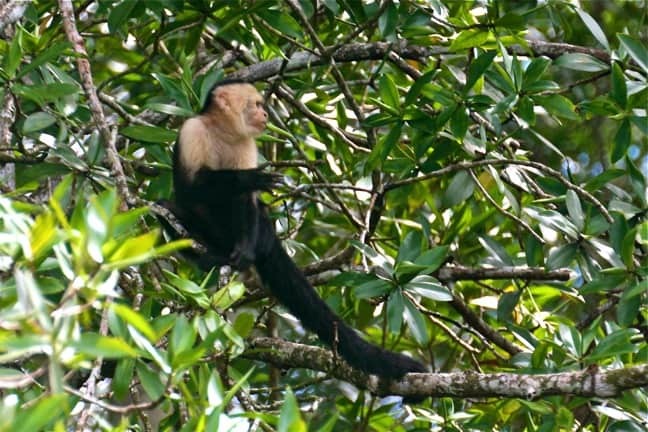 After crossing the river, I spotted a White-Faced Capuchin (the one you see above) low in the trees, less than 20 feet from us. If you’ve ever seen monkeys in the wild, you know that the little buggers are fast and not prone to sitting still. I’d already missed shots of Costa Rica’s Capuchins twice in Corcovado because I was too slow getting my camera gear together. So this time I was determined to get the shot. Since he was right above me, I lifted the camera gear (tripod included) up, not even bothering to take off the backpack. The light was low. The monkey was quick. My flash malfunctioned. My glasses steamed. My eyes filled with sweat. I cursed in ways that would make a sailor blush. Following along as the monkey leapt through the treetops, I snapped the shutter over and over until he disappeared from sight. It took a few minutes to realize that mistake #3– holding 20 pounds of camera gear above my head for around 15 minutes, like I was John Cusack at the end of Say Anything– would bring a world of hurt into my day. As soon as I put the camera gear down, I knew something was wrong. I felt dizzy and lightheaded. No matter how deeply I breathed, my brain didn’t feel like it was getting enough oxygen. Mary gave me bottles of water with electrolyte tablets in them, but no matter how much I drank I couldn’t fight off the feeling of dehydration. When I sat down to take off my boots to cross the river, I couldn’t get my fingers to work properly to pull off my socks. And when I stood up again, Freddy had to hold onto me to keep me from falling as the blood rushed to my head. When we got back to the San Pedrillo Ranger Station, I collapsed onto a bench. Feeling nauseous, I barely touched my lunch. We unfortunately had to cancel our planned afternoon walk to a nearby waterfall. I was so weak from heat exhaustion, we had to wait for a boat to take us back to Casa Corcovado. I felt embarrassed and emasculated by my failure, but a dip in the lodge’s fresh water pool helped cool my body temperature down enough that I was able to think clearly again. 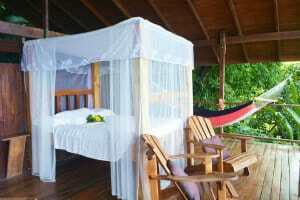 We spent the rest of the day relaxing, as I was determined to make the hike to the Sirena Ranger Station the next day. It proved to be an eventful morning, with beautiful weather and wonderful wildlife sightings ranging from a Lesser Anteater and a pack of Collared Peccaries to a Curassow (a crazy-looking Turkey-like bird) and a family of Howler Monkeys with babies in tow. 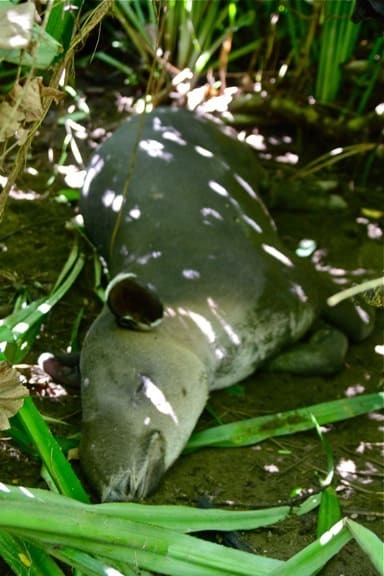 At the end of our hike, an elderly guide pulled us aside conspiratorially and told us he knew where we could find a Baird’s Tapir. One by one we took turns weaving 20 yards through sharp sawgrass to watch it sleeping in its den. It felt like some sort of cosmic Karma reward for my suffering the previous day. In retrospect, I’ve probably told the story about working myself to the brink of heat stroke in my quest to get a photo of a hyperactive monkey far more than I have the story about our special moment with a special animal that looks like a cross between a pig, a donkey and a rhinoceros. For some reason, it seems easier to share the downsides of travel than it is to share its joys and blessings, almost like showing battle scars from hard-fought victories. There are probably not a lot of people on the planet who can relate to the blissful joy of seeing a rare species sleeping in the comfort of its den. But I guess everybody can relate to making stupid mistakes they later regret. Fortunately, this time my idiotic decisions ultimately had a happy ending. 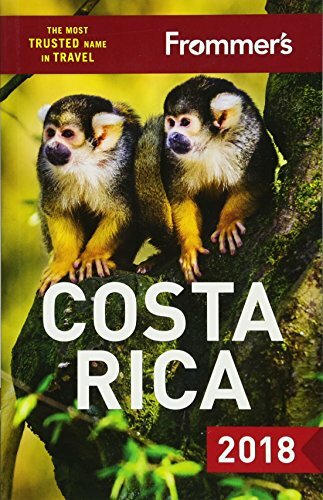 • You’ll probably expect mosquitos and horseflies from your time in the rainforest. But the pests to watch out for are the ones you can’t see. The Purrujas (a.k.a. no-see-ums) you’ll find in the Osa Peninsula’s beaches and marches are brutal and impervious to DEET. Use Skin So Soft instead. • The peninsula is home to many different kinds of snakes, including the remarkably venomous Fer-de-Lance, one of the deadliest animals in the world. Chance are you’ll never see them, but it’s important to be careful when walking over rocks or logs to look down before you step. • Africanized (a.k.a. “killer”) bees have become increasingly common in the area, because their honey production can be 20 times that of local stingless bees. 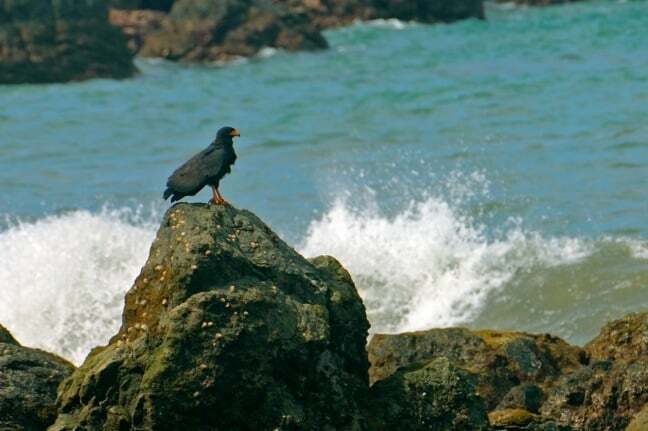 You’re unlikely to see them in Corcovado, but attacks in Puerto Jiménez are not uncommon. If they do attack, running back and forth rather than in a straight line is your best chance of avoiding getting stung. • Crossing rivers is a necessity in Corcovado. Make sure to cross at low tide (tide charts can be found at the park’s ranger stations), especially during the rainy season. And since Crocodiles and Hammerhead Sharks patrol the estuaries of the Ríos Claro and Sirena, it’s best to cross at the shallowest point you can find upstream. 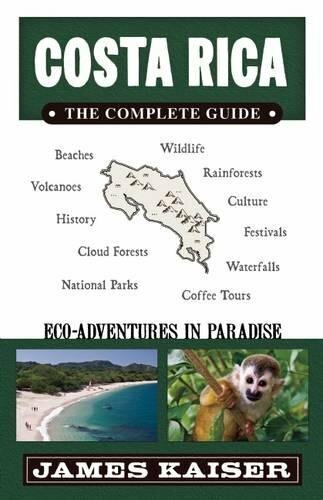 • Reading that “crocs and sharks patrol the estuaries,” swimming in the ocean is probably not the first thing you’ll want to put on your Corcovado agenda. Which is a good thing, as riptides are common there. But if you’re crossing a river and accidentally find yourself being pulled into the sea, swim parallel to the beach until you are free of the current, then make you way to the shore. • Corcovado has a sizable population of endangered peccaries, which travel in extended family groups of up to 30 members. They rarely attack humans, but have terrible vision. If you see some (which we did during our hike), do not block their path or startle them. If they do come after you, your best move is to climb a tree until they decide to move on. 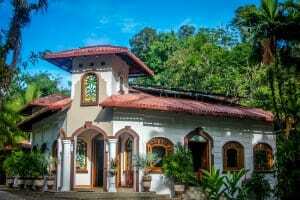 Luna Lodge – Located adjacent to Corcovado National Park, Luna Lodge is a secluded 3-star eco-lodge that is situated on approximately 60 acres of tropical wilderness. The lodge offers nature hikes, birdwatching, yoga, and a pool and spa. Guests can also enjoy complimentary internet in all areas. Check Rates or Read Reviews. 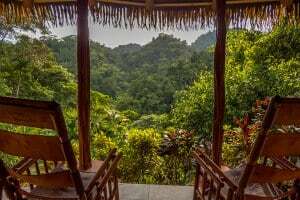 Lookout Inn Beach Rainforest Eco Lodge – An off-the-grid solar lodge, Lookout Inn is for adventure travelers looking for affordable accommodations deep in a rainforest jungle with an Ocean View. There are 11 rooms ranging from open-air tree house rooms, “A” frame style tiki-huts, private bungalow cabins and traditional rooms. A charging station and 24/7 WIFI is in the Main Lodge. Lookout Inn is a gay and lesbian friendly lodge. Check Rates or Read Reviews. LagunaVista Villas – Sitting atop a small peninsular overlooking a freshwater lagoon and Playa Carate, LagunaVista lodge offers 8 solar powered and eco-friendly villas (double or family size), with plunge pools. 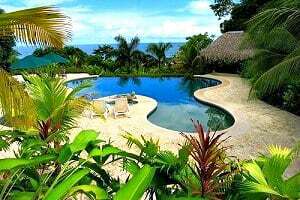 While this hotel is a bit further from Corcovado than the above options it does offer additional activities like an infinity pool, kayaking, surfing, fishing, beach combing and horse riding. Check Rates or Read Reviews.